CJR Voluntary Participation&mdash;Should I Stay or Should I Go? This article was co-authored by Jonathan Pearce, CPA, FHFMA, principal, Singletrack Analytics. CMS finalized its proposal to allow about half of the hospitals in the Comprehensive Care for Joint Replacement (CJR) program to discontinue participation beginning January 2018. Now hospitals in the voluntary Metropolitan Statistical Areas (MSAs) are scrambling to decide whether to leave the program or continue to participate. Many factors are involved in this decision, including investment in infrastructure, care management processes, and physician and leadership engagement. This article focuses on the financial results that may accrue to a participating hospital throughout the remainder of the CJR program as a result of the migration from historical baseline to regional target rates, and rebasing of the historical baseline. 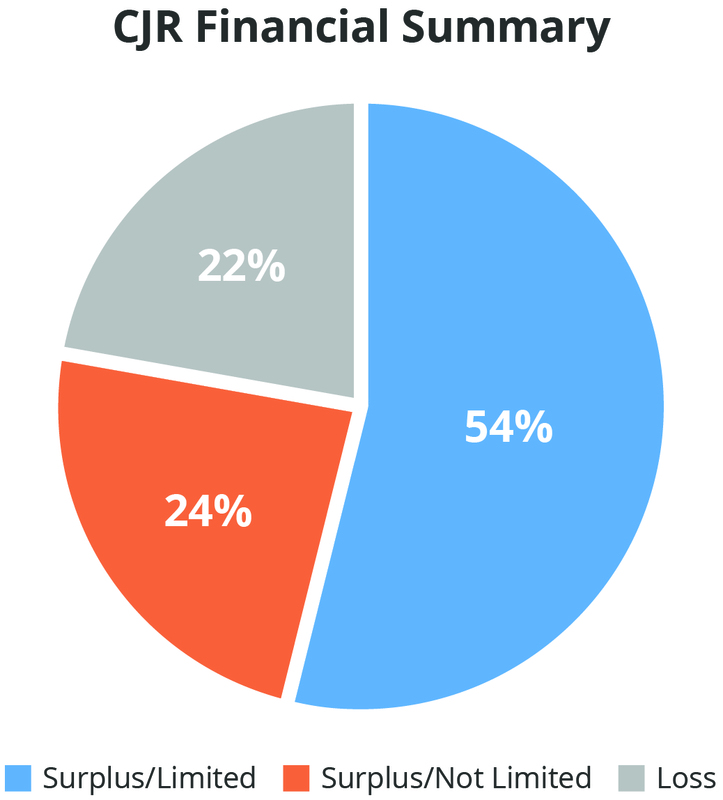 Financial success in the CJR program occurs in 2 ways, depending on the performance year. In the first 2 performance years, the episode financial targets are derived primarily from the hospital’s cost during the initial baseline period (2012-2014), while in the last 3 years of the program, the financial targets are derived primarily from the average episode costs of other hospitals in the same geographic region. 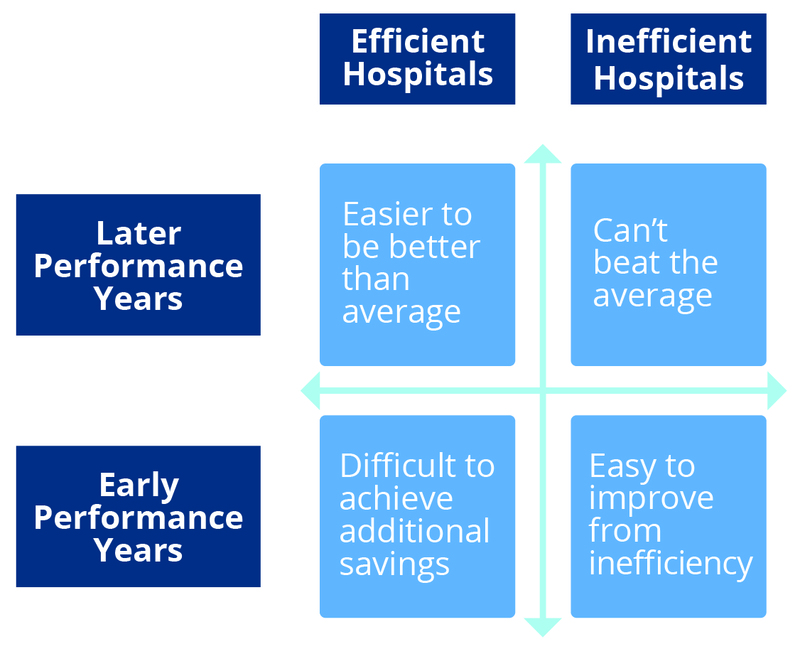 Therefore, hospitals whose use of postacute services is generally inefficient (postacute cost exceeding 50% of the total episode cost) have high baseline costs and correspondingly high targets, and may have greater opportunities to reduce the postacute cost and achieve savings during those periods. However, during the last 3 years of the program, targets are increasingly or entirely derived from the regional average costs, which are often significantly lower than an inefficient hospital’s baseline cost. Unless inefficient hospitals have significantly reduced postacute cost during the early years of CJR, they may find the transition to regional targets will reverse any previous surpluses and will instead generate losses in the last 3 years of the program. Conversely, hospitals that already have low postacute costs (postacute costs less than 40% of the total episode cost) may have low baseline costs, and therefore may have found it difficult to achieve savings in the early years of the program. However, after the transition to regional rates in year 4, they may find their targets increasing and thus may create surpluses in later years when none were possible during the earlier performance periods. In many cases, a successful CJR strategy has been to simply wait out the changes to the target and expect performance to improve when the regional rates kick in. Under the blend of historical and baseline targets used in the first CJR performance year (PY1), any hospital that reduced its episode cost by more than the discount percentage was able to achieve a financial surplus. Apparently, many hospitals were able to implement these types of changes. More than 75% of our client hospitals achieved a surplus and more than half achieved a surplus that exceeded the PY1 stop-gain limit. Less than 25% incurred losses. The situation will dramatically change, however, when targets become based on regional averages. Those hospitals with episode costs below the average of the region (not their own historical cost) will incur surpluses, while those with costs above the regional average will incur deficits. Thus, while a large proportion of CJR participants may be creating savings based on baseline-derived targets, many will lose money when regional targets are implemented simply because of the use of regional data rather than the hospitals’ historical data. The entire financial dynamic has been upended. Because of this change in the derivation of the targets, past performance is definitely not indicative of future financial results. Therefore, it will be important for hospitals considering continuing participation in CJR to model their performance using the regional target rates.